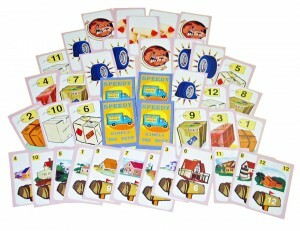 Speedy Parcel, the latest cooperative title from Family Pastimes, is a card game about package delivery service. For $10.50 the game includes 36 cards of parcels, homes, guard dogs, flat tires, and spare tires—also three sets of rules for playing with kids, teens, or adults. Just imagine the package you’re waiting for is more games!